Arriving at library fifteen minutes before closing time, one is destined to leave with a pretty random crop of books. 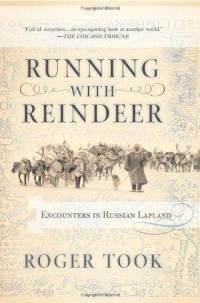 I grabbed Running with Reindeer - Encounters in Russian Lapland when sprinting by the history section, expecting some mixture of ethnography, anthropology and yes, history, served in a dry academic sauce. I got top class travel writing instead. What a pleasant surprise! Running with Reindeer has everything that really good travel writing is supposed to have. Exotic location. A lot of ground covered. High definition portraits of quirky characters encountered on the road. Tons of background information on politics, history, ecology, geography and any other -athys and -ogies you can wish for. A touch of adventure, a sprinkling of opinion. Wonderful! Russian Lapland is not exactly a land most people would be familiar with, nor is it the easiest one to travel. As everywhere, traditions of the indigenous people in the area are disappearing fast. Bureaucracy and living off the land nomadic style, do not exactly go together. People who used to literally run with their reindeer can now be found in high rise concrete blocks. Not all of them, not yet. But I have the unpleasant feeling that a few decades from now Saami way of life could be truly a thing of the past, fully belonging to the history shelf. We are not too good in conserving ecological diversity, especially if it cannot be milked for money. I'm not trying to say that the 'good old nomadic ways' translate unconditionally to 'heaven full of pastoral beauty'. It's quite likely that after a week of such a bucolic bliss I would run off screaming. Yet, it's hard to read Took's account of wilderness being transformed by civilisation and not to feel some sadness. One minor fault, springing mainly from my personal preferences, not objective judgement. My mind tends to drift when assaulted with too much landscape. Topography is fine when you have to actually travel through it, but to a reader's (mine!) mind, all those valleys and knolls and hills and lakes and other features are pretty meaningless. If there are too many of them, my brain automatically gets into neutral gear. You must have some landscape in a travel writing book, but in Running with Reindeer I detected too much of it for my liking. On all other fronts, the book is fantastic.